Most of the time, I use vanilla sugar as my regular sugar. And that is because it is SO easy to make. Whenever a baking or canning recipe calls for a vanilla bean, it usually means scraping out the seeds for the recipe and/or soaking the bean in liquid and then removing it before carrying on with the recipe. Well…do NOT throw that bean away after that! Those things are expensive and they are still packed with flavor!!! All you do is dry off the used bean (if it is wet) and then soak it in a container of sugar for a few weeks before discarding it. 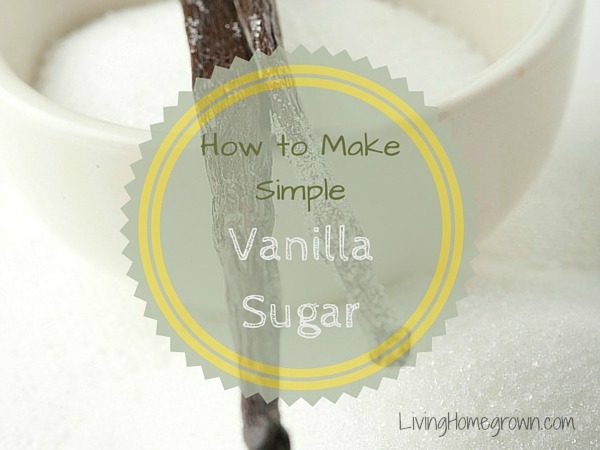 So next time you have a vanilla bean left over, throw it into your sugar! So easy. Make applesauce the EASY way - in a slow cooker while you sleep. Then can or freeze it so you can enjoy it later when apple season is over. Learn how to home ferment your own ginger ale soda (aka ginger beer) using a "ginger bug". It is easy, delicious and you know EXACTLY what's in it. Learn how to live a more DIY and productive home - Interview with Erica Strauss of NW Edible Life and author of The Hands-On Home. Learn to make and use infused vinegars with herbs and fruit. They are a great way to utilize seasonal flavor all year long in your kitchen. Learn ALL about Weck® jars: how they are used, what it means to NOT be USDA approved for canning, plus the pros and cons of this type of jar. Learn to use the KonMari Method of organizing to make your homestead more efficient.